Born in October 1995, Stephen has appeared as a soloist with the Stockton Symphony Orchestra, Prometheus Symphony Orchestra, San Francisco Symphony Youth Orchestra, San Francisco Chamber Orchestra, Palo Alto Chamber Orchestra, and Monta Vista Chamber Orchestra. Stephen will also perform Shostakovich’s Violin Concerto No. 1 in A Minor with the Bear Valley Symphony Orchestra at the invitation of Carter Nice and the Bear Valley Music Festival this coming August. Following this debut, he will perform with the California Youth Symphony as the winner of the California Youth Symphony Young Artist Competition. Featured as a soloist on From the Top, the NPR classical music program, Stephen has broadcasted with the National Public Radio throughout the country. Stephen has been selected as one of the nine Exceptional Young Violinists selected world-wide to take part in the 2009 Starling-Delay Symposium on Violin Studies for master teachers Itzhak Perlman, Paul Kantor, Joel Smirnoff, David Kim and Chee-Yun at the Juilliard School, where Stephen performed in public master classes and recitals. Stephen was invited as the guest soloist to perform classical music before a special advanced screening of Paramount Pictures’ film, The Soloist. Stephen has also been selected as a young artist to perform as a Rising Star of California. 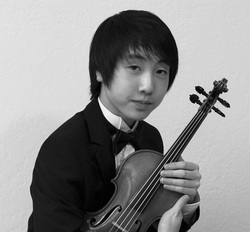 Stephen has received numerous first prizes in the Alexander and Buono International String Competition, the San Francisco Symphony Youth Orchestra Concerto Competition, California Youth Symphony Young Artist Competition, Mondavi Center Young Artists Competition, Felix Khuner Concerto Competition, Palo Alto Chamber Orchestra Concerto Competition, and the San Francisco ASTA (American String Teachers Association) Competition. As a winner of the California State Final ASTA Competition, he represented California, and the San Francisco Conservatory of Music, in the 2009 National American String Teachers Association Competition. Also performing chamber music, Stephen and his duet have been awarded first prize in the Northern California Branch of the MTAC (Music Teachers’ Association of California) VOCE Competition. They will represent the Northern California Branch in the 2010 VOCE State Finals Competition. As a recitalist, Stephen made his Carnegie Hall debut in 2009 and has been presented by many venues throughout the United States and Europe, including the San Francisco Conservatory of Music, the Fremont Symphony Guild, St. Paul’s Towers, the Julia Morgan Theater, the San Mateo Performing Arts Theater, the Saenger Theatre in Alabama, Paul Hall in New York, Harris Concert Hall in the Aspen Music Festival and School, and Valle d'Aosta in Italy. Stephen has attended the Aspen Music Festival and School as a scholarship student of Paul Kantor since the summer of 2009, where he performed in numerous recitals and received master classes from Pamela Frank and Joseph Swensen. Since the age of 11, he has been a member of the San Francisco Symphony Youth Orchestra, and he has toured Germany and the Czech Republic as the youngest member. Stephen is co-concertmaster of the Chamber Orchestra in Monta Vista High School in Cupertino, California. Stephen began playing the violin at the age of three and has studied with Bettina Mussumeli in the Pre-College Division of the San Francisco Conservatory of Music since he was eight.